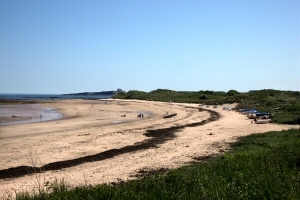 Newton Holiday Cottages are located in the picturesque coastal village of Low Newton by the Sea in Northumberland. The village boasts superb sea views and splendid beaches, and is an ideal choice of base for a self catering adult group or family holiday. Whether you are interested in bird watching, walking, visiting the many stately homes and castles throughout the region, or are just seeking a relaxing beach holiday, this lovely part of Northumbria offers all of that and more. Whether building sand castles on the beach, playing hide and seek in the dunes or exploring the rock pools, Low Newton is always a special favourite with children. At the centre of Low Newton is an 18th century cream-painted square owned by The National Trust. The Ship Inn, situated in a corner of the square, offers a warm welcome, real ales and fantastic food. The beach in front of the square is protected by a natural reef. This forms a protected and safe bay and is popular spot for all types of watersports and visiting yachts. Indeed, it has been acclaimed by Boat Magazine as one of the UK's top ten most picturesque moorings. To the south, Low Newton beach joins Embleton Bay, to which a spectacular walk can be had along the length of the beach with the imposing Dunstanburgh Castle as your destination. Between Low Newton and Embleton Village is Dunstanburgh Castle Golf Club, one of many fine links courses available within a short drive. Low Newton is a favourite spot for bird watchers due to the easy accessibility of its beach, rocks and bird reserve, and the vast variety of bird life for which this coast is renowned. We know that you will greatly enjoy your holiday here and look forward to welcoming you.